The day I found out I was pregnant with Jeremiah we were on family vacation in Yellowstone. Hubby and I were thrilled, especially since we'd gotten pregnant on our first try (again!) despite all my pain and problems. A few days later we stopped at the cemetery in my hometown to visit my sister's grave - the same grave where Jeremiah would be buried just a few months later. I'd been nervous about getting pregnant again, mostly because I'd had some painful birth-related injuries (trust me, you don't want to know) with both of my prior births. They took 6 and 15 months to heal, respectively, but are definitely totally unrelated to the losses we later experienced. So naturally I was worried for myself but also very concerned about how small David had been at full term, how brutal and long labor was (30+ hours each), how doctors had commented on the placentas and cords, and other complications. I went to the OB/GYN just weeks before I got pregnant with Jeremiah to get a checkup and ask if she could see any reason to be concerned about another pregnancy with my history. She said everything seems fine and there was no reason to expect any recurring problems. With Jeremiah, I had morning sickness in the first trimester, as expected, and was measuring right where I should be all along. I was quite hopeful that maybe this time I'd have a normal pregnancy, maybe this time the baby would be perfectly healthy, maybe this time I wouldn't have lasting injuries from the delivery, maybe this time we wouldn't have to move to a new state right after the birth, maybe this time we wouldn't lose our health insurance, maybe this time things would be OK.
Then just before Christmas (maybe it was Christmas Eve - wish I could remember the exact date) I was wrapping presents in my bedroom after the kids were asleep, when I suddenly got the impression that there was a man standing about 6 feet in front of me and that he'd come to take the baby. I thought I was being ridiculous and paranoid. Sure, I'd had some trouble with both of my previous pregnancies but not until the third trimester, and things seemed to be going perfectly this time. I went to lie down for a minute and thought I felt the baby move, so I dismissed my impression as silly worrying. Only later did I realize that the movement I felt that night and in the following days was Jeremiah's body moving around in the amniotic sac in response to my movements. By New Year's Day I was getting worried. When I was 20 weeks pregnant with David he was kicking hard enough that hubby could feel it, but nothing like that with this one. I had an appointment the next day which I hoped would end the worrying. My two small kids came with me to the appointment and played in an adjoining room while the midwives checked me. I measured 21 cm - just right. But then they tried to find a heartbeat with the Doppler and couldn't. They tried another Doppler and then another. Nothing. They said to call the OB/GYN clinic and get in for an ultrasound. I gathered up my kids and went to the car, stunned. I called hubby at work and told him they couldn't find a heartbeat. He left work immediately and somehow I managed to drive home. Next we went to the clinic at the hospital and they couldn't find a heartbeat with the Doppler either, but told us we would have to get a detailed ultrasound to confirm if the baby had died. Since it was the day after New Year's everything was booked and we were told we'd just have to wait until the following day for that. What a long miserable night that was, knowing our baby was almost certainly dead inside me. The next morning a friend watched our kids while we went for an ultrasound. That's when we found out our baby was a boy - with no heartbeat. There were no obvious problems or deformities seen. We cried all the way home. In the afternoon we met with a doctor and discussed our options - either wait and see if labor would start on its own or go the hospital to be induced. The choice seemed obvious - go to the hospital. I was horrified about what was about to happen, but also anxious to get it over with. At the hospital we had to walk to our room in the maternity ward, past all the beautiful, healthy, live babies being wheeled down the hall to their mothers. Devastating! Once in my room it was a long wait before the nurses came to give me the first dose of Cytotec, a very unpleasant procedure indeed, and this was repeated every four hours. Cytotec, by the way, is an ulcer drug commonly used for labor induction but not approved for this purpose. After awhile the cramping started and became progressively more powerful over the next several hours. I had decided to forego an epidural or any other drugs because I'd gone "natural" for 30+ hours of labor for each of my previous full-term births, and was sure this would be quicker and less physically painful. As midnight approached the pain was as intense as it had been for my full-term births. Since time had lost all meaning, I don't know how long it went on like this - maybe an hour, or even just a half-hour? When the pain eased up for a few minutes I got up to use the bathroom and felt what I thought was his head coming out. After quickly going back to the bed, he was delivered breech by the nurses. I was glad they were in the room at that time because I had been afraid of being alone when it happened, as babies so small can come without any warning. He came out with the amniotic sac intact, so the nurses broke it open, took him out, cut the cord, and put him on a folded up blanket. The nurse asked, "Do you want to see your baby?". I had her describe what he looked like so I could be prepared in case there was something horrifying about him. She responded that he looked perfect, but had some swelling of his head and neck, which commonly happens after an intrauterine death. We held him for a long time - our perfect baby in miniature. He was 8 1/2 inches long and barely under one pound (15+ ounces). 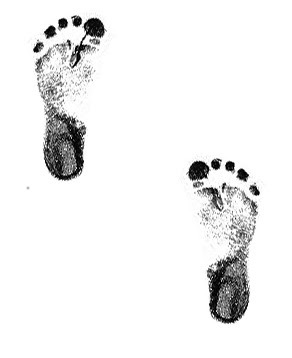 We were amazed at his tiny fingernails, his perfect feet, his face that looked so like David's when he was born. If he'd been badly deformed, I could at least be happy for his sake that he could find peace in death rather than living a life of extraordinary pain and difficulty. But there was no sign that he was anything other than perfectly healthy, which made the situation feel all the more tragic. I hoped that with all the testing to be done we could get some kind of medical explanation for our loss. The name Calvin had been chosen long ago if the baby was a boy, but since the unthinkable had happened we decided to name him something we'd never thought of. At my sister's suggestion, we named him Jeremiah, from the Bible verse Jeremiah 1:5 "Before I formed thee in the belly I knew thee." We felt this name was more appropriate for the situation, and especially since Jeremiah was born on January 5 (1:5). As we were holding Jeremiah, the doctor became concerned because the placenta had not delivered and there was still quite a bit of bleeding. According to her, the odds of this happening for a mid-trimester loss are about 1 in 5. The placenta did deliver soon after, but was incomplete. Hubby held Jeremiah and nervously rocked him back and forth just as if he were alive, while nurses on either side of me held my arms down. Then the doctor reached in me with her whole hand and tried to pick out the retained bits of placenta. It was so painful that even now, 2 1/2 years later, the memory of it still turns my stomach. After a few tries like this with little success, the nurse put in an IV and gave me Pitocin and Fentanyl for pain before the doctor tried again, this time with ring forceps. The fentanyl did little for the pain, but the remaining pieces of placenta were successfully removed and I was relieved to avoid a D & C.
After this ordeal the nurses took Jeremiah away to take photos and footprints. Then they brought him back for our last goodbye and we took photos. We made arrangements for a local mortuary to take his body to the airport for transport to my home state, where we would bury him at the foot of my infant sister's grave. Later that morning we left the hospital. I'd thought it was hard leaving the hospital with empty arms when David was born, because he was in the NICU for 5 days but I was discharged after only one day. This time we left the hospital with only a memory box. It is nice to have something tangible to remember our baby - a little teddy bear the nurses had photographed him with, his tiny perfect footprints in ink and in plaster, and a few other small mementos. Once home, our greatest joy was to see and hold David and Tania again. It was so sad to tell them their baby brother had died. Tania was not quite two years old, and didn't really understand. David, however, had been very excited about the new baby we were going to have. Over the next week, I took down the crib and packed away the maternity clothes. Hubby tried to work from home some and made some brief appearances at the office. I lost 10 pounds in 3 days - why bother eating when the baby I was trying to hard to nourish was dead? We arranged everything for the burial out of state and then tried to figure out how to get our family there -driving that far in January was out of the question and flying was too expensive. My best friend and her pilot husband made it possible. We were able to get inexpensive standby tickets and had to wait at the airport for only a few hours before we were able to get on a flight. The mortuary in my hometown provided a tiny casket for Jeremiah at no cost and we were able to transport and bury him without spending a large sum of money. My parents (especially my mom) had been opposed to our burying him because of the cost and inconvenience, and would have preferred that we had the hospital 'dispose' of him. While it certainly is costly to pay for a birth and a burial at the same time, we felt this is the right thing to do for our son. Thankfully, my parents did not object to our burying him with their daughter, my sister - and I'm certain she doesn't mind sharing her grave. Our time at the cemetery was brief because of the bitter cold. We had a lot of family come to support us, as well as my friend and her family. We were very grateful we were able to bury our son. It felt like closure. We had no idea our nightmare was just beginning. After returning home, we tried to establish a new "normal". Hubby went back to work and I tried to make life as normal as possible for the kids. Every moment of every day I missed Jeremiah horribly and felt that I mourned him all alone because not even my husband could comprehend how devastating the loss was for me. I'd felt him growing and moving inside me and felt his spirit always with me for months, and now there was only an emptiness that nothing else could ever fill. A few weeks later all the test results were in. All were negative except for a moderate positive result on anticardiolipin antibody IgG, which we're told is not significant unless there is also a positive result for IgM; after six weeks this was retested and the level was "inconclusive". I got copies of my file from my doctor and noticed on the pathology report that Jeremiah's cord was "hypercoiled". No one had mentioned this to me. I called my doctor . Wasn't it suspicious and strange that all three of my babies had something odd about their umbilical cords and/or placentas? I was told the answer is no - this loss was just a fluke, just bad luck. I could go ahead and try for another pregnancy as soon as I wanted. He discussed it with the perinatoligist and she said I should take baby aspirin in my next pregnancy, just in case. Take an aspirin and call me in the morning, basically. By this time I had started having chest pain and heart palpitations pretty consistently for 2-3 days each week. My doctor said to get it checked out just in case, so I was referred to cardiology at have an EKG, echocardiogram, and be hooked up to a Holter monitor for 24 hours to try to pick up the irregular heartbeat. But, of course, a monitored heart never skips. I'm told everything looks OK - it's probably just stress. Now I'm a little less stressed about the stress-induced problem, but it's still disturbing on days when it's happening 5-6 times a minute. With all the test results in and no clear answers, we decided to try again. We were worried but felt the odds were on our side. We'd never heard of anyone suffering multiple losses like the one we'd just had. Our doctors said they'd never seen it. We figured it would probably take several months to get pregnant so we might as well start trying. We never imagined that in six month's time we would have another dead baby in our arms.